The Locker Module allows you to display the contents of the locker or folder within a locker. If there are subfolders, users will be able to navigate into those folders to view all the available contents. 2. In the Insert Module Screen, click the Locker tile. 3. 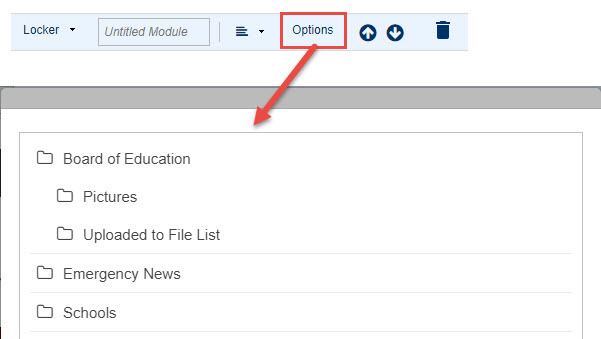 Use the Options button on the toolbar to select the folder or subfolder of the locker you wish to display. Users will be able to navigate into subfolders, but cannot navigate to a level higher than the folder you select. 4. Optionally, you may enter a title, which can be justified if desired.